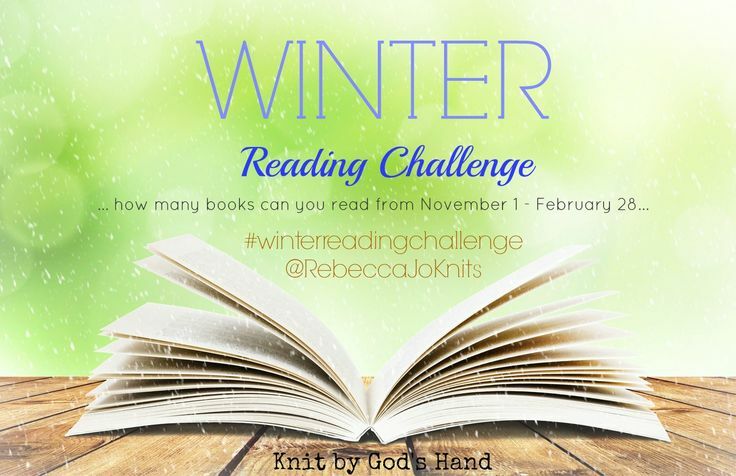 Here we are... in the 3rd post of the Winter Reading Challenge. ... I can't believe we're in our 3rd round... The goal is to get as much reading in February to finish up & then one final post to carry us out in March!!! I loved so much seeing what some of you were reading & seeing posts on Instagram on the books you are reading. This has just been a fun way to spread the love of books... good books... with a little fun giveaway at the end. A $20 Target card, a knitted goodie made by me, a book related item.. & who knows what else I'll throw in... you can never tell what I'll do. This is the story of a girl who was heavy her whole life & the struggles she had in going through college & deciding to get the weight off & how it effects her life. I had a love hate with this book. I love a story of someone who deals with weight issues... I always say, if you never had to deal with weight issues, you don't understand weight issues... & this girl understood it. But I also had a hate relationship with this book because she just wasn't that much of a 'personal' character to me. & I say character even though its an autobiography. I don't know. It was hard to connect with her. Apparently she's a blogger somewhere that writes about food now & all her skinny ways. I don't care enough to even look her up to stay in contact with her writing. OH MY GOSH. I was literally in tears with possibly snorting happening. I will say, I did this one on Audio Book ... made it 100 times better, I would imagine. Hearing Tina's voice reading it, with her own personal style, I honestly lost it sometimes. But she's got real concerns & points of views that are serious, but I still love her take on things. I had put off reading this one for awhile because I knew it was going to be good. It didn't disappoint one bit. I really like Dan Harris on Good Morning America. He starts my days off every Saturday & Sunday morning. He had been talking about his journey with meditation. Now, I've been intrigued with the idea of slowing the mind down, deep breathing - all going back to that anxiety thing again... & I wanted to check this book out. First, know this book basically tells you to meditate - breath. All the top tips you'll get on meditation.... it's more of a biography of Dan Harris's life. And for me, I know real meditation is sort of a Buddhism tradition. (For the record, so I don't freak my dad out - I like the idea of calming the mind - almost prayer like... I'm not converting to Buddhism... ok dad... let's continue.... ) Dan Harris just sort of dives into searching for all sorts of spiritual paths on finding peace & really, just kind of dogs it all out in the end. I was so disappointed in that side of the book. The part that really took me out of this book was when he was talking with Deepak Chopra & Chopra is quoted as talking about the Bible & God as 'the dead white guy' from that book.... yeah... I'm finish with this book.... I only gave it 2 stars because biographies do intrigue me. Everyone's life has a story... I may not have to like your story. I definitely didn't like the book. This is pretty much a classic - right? I can't believe I had never read it before. The story of a family who helps Jews hide when Germany takes over, & ends up going to prison for protecting these people. What a heart wrenching book. The person I mostly want to talk to when I get to heaven is Corrie's sister, Betsy... what a calming presence she was to Corrie & reminding her what to be thankful for & to focus on. How these sisters would preach to others in the camp with their Bible & bring others to Christ in the worst of situations... I'm glad I now have this story in my life. Wow... what a brave little girl... who turned into an amazing young woman. I remember this story being on the news. The young girl who was abducted from her bedroom & kept captive for months to be discovered & returned to her parents. Hearing her story is just chilling. The things this crazy man would do to her, how he made her life, how she survived. It is tough to read at times & so frustrating because I just don't understand how evil people are. I'm just amazed at how she has handled the situation, keeping her faith & has learned that life is about choices. How you handle the things that happen to you, its all up to you. She chooses to not give this crazy man one more bit of her life, but to see the blessings she receives every day. It really is an amazing read. I read the Hiding Place many years ago. I love Corrie ten Boom. What faith she had! I listened to the Elizabeth Smart book a while back. I can't even imagine. I'm on the waiting list at the library for Tina Fey's book. Thought I'd give it a chance. I also read "The Hiding Place" many years ago. It sparked my obsession with that time period. A friend of mine just went on & on about Tina Fey's book. I've stayed away because of her portrayal of a certain vice presidential candidate. I've seen "My Story" but wanted to hear some reviews from people I know before I read it. I'll have to put it on my list. Thanks for hosting this! Great idea! adding the hiding place to my list! i actually discovered that andi mitchell blog before i knew she wrote a book, but the book doesn't sound like something i would like to read, but her blog was interesting and very entertaining. i only went through it one day, i dont read it regularly and i cant remember what it was called. Ohhhhhh I didn't know Amy Smart had a book?!?!? I definitely want to read that! I've been interested in Bossy Pants and the Elizabeth Smart book, just haven't gotten around to them. This might be the kick in the pants I need. 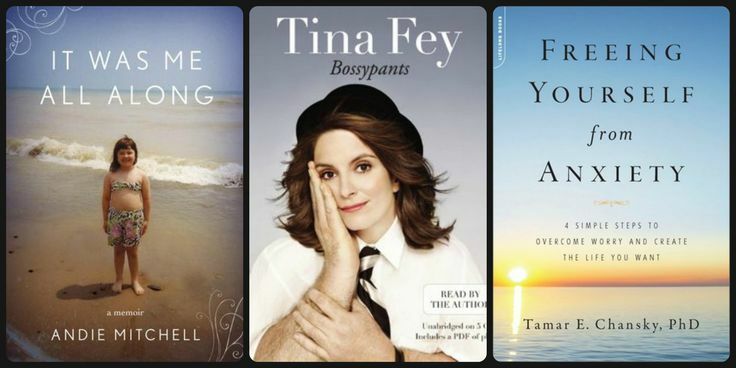 Oh man, I really want to read Bossypants.. I love Tina Fey! Anyhoo, great post! When I see the cover I always think 10% Happier is a book I would like, but for some reason whenever I would read more about it, it would sway me from wanting to read it so I'm actually a little bit happy you weren't the biggest fan of it- I feel like I'm not missing out! I really need to start reading again. Thanks for the great suggestions! I should have some reads to link up with in March! You've been busy lady! 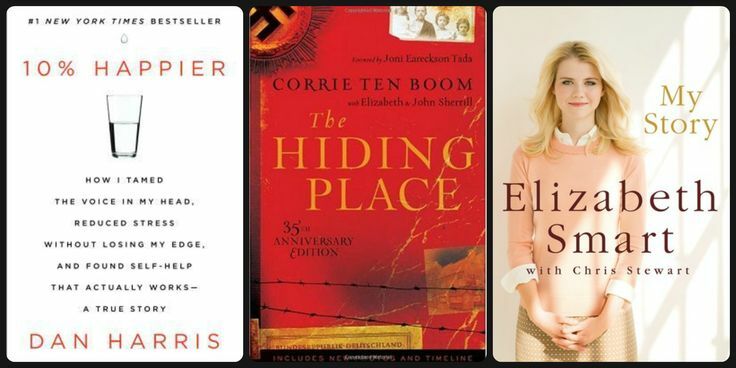 I have started the Corrie Ten Boom boom but need to pick it back up again because I heard it's great. Hope you are having a great week Rebecca. Happy Valentine's Day! i went to the ten boom house when i was in holland many (10) years ago. i have the movie somehwere on vhs! ha!